Interior Design Story: Hand-made decorations... Wow! The use of hand-made decorations has always been cool. And in this particular case it is especially so. 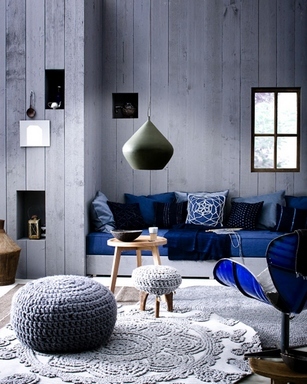 See how masterfully did the designer insert these knit items into this room, and how solid and stylish the result is. I love the floor cushion. I've been trying to knit something like that myself butgave uo half way! It's fun being creative when decorating your home. It's also a good way to personalize your space.